It is that time again, FNWF is on tonight so if you would like to join in the fun, pop over to our host Cheryll's blog and sign up. I'll share a cuppa and a plate of Anzac biscuits with you, so hope to see you there. I'm going to quilt a secret project and add the binding so it may be a long night. Will look forward to checking out your blogs tomorrow to see what you got up to. 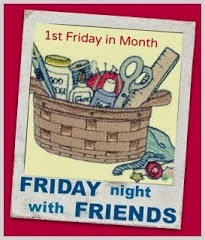 I'm finally sitting down ready to start stitching.....see you there.